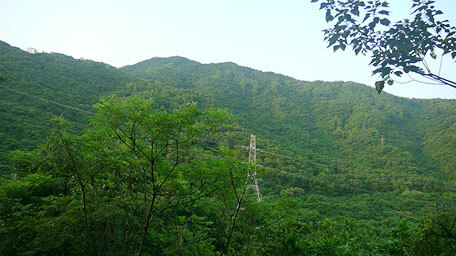 Razor Hill, 432m height, is located at the south of Sai Kung and the north of Tseung Kwan O. 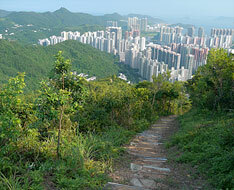 At the top, it offers a splendid view over Sai Kung and Tseung Kwan O. 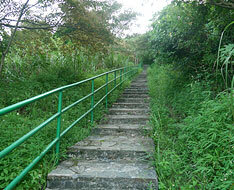 The uphill path of Razor Hill are quite steep, it would require clambering. 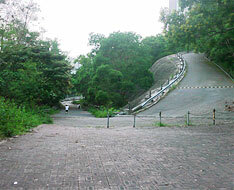 1.Downhill straight along the south ridge of Razor Hill could lead to Po Lam Road North. 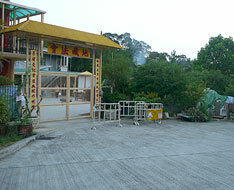 2.At Po Lam Road, you could take bus. From the bus stop of Pik Uk (the way to Sai Kung), cross Clear Water Bay Road by taking the pedestrian bridge, then go forward along Clear Water Bay Road keeping to the right side toward the way to Sai Kung. Not far ahead, follow Pik Tsui Road on the right at the junction, it is gently up. Head to the end of the road, then follow the side-path beside the house on the left-front. Passing through the patch of garden, it goes up to the graveyard. Trace the path up through the group of graves. Pass a few of graves, it joins the uphill muddy path on the upper right. Note: The uphill path of Razor Hill is quite steep, it would require clambering! 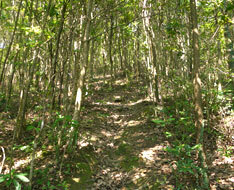 Head the trail, it is obvious and slowly ascends through the woods. In the later section, it turns steep up to the extent required to clamber. After the steep climb, it pushes to the hilltop. Along the top ridge to the right not far, it comes to the range pole and opens up. 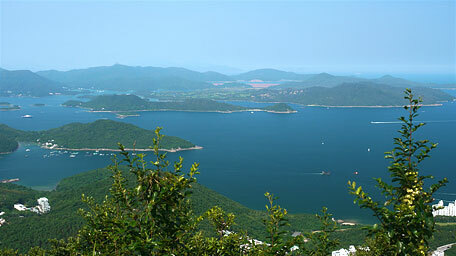 Looking around, it offers a splendid view over Port Shelter, Sharp Island, Kau Sai Chau and High Island Reservoir. 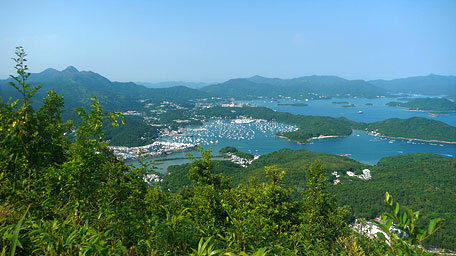 Beneath the rolling hills of Ma On Shan, the coastline swinging along Sai Kung and the yachts in Hebe Haven scattered about like stars in the sky, fashion themselve into a spectacular picture. Everything slightly looks vague in the thin haze. 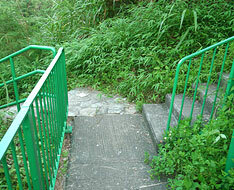 Continuing on along the trail, it descends the long flight of steps. Along the south ridge downhill, it seems to have many branches but they almost merge into the main path. On the way looking to the left, Port Shelter could be seen. 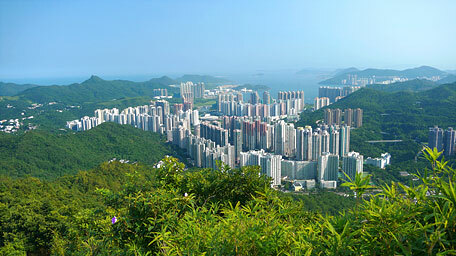 Gazing forward, it offers a full view over Tseung Kwan O. Overlooking to the right, the rear of Tai Sheung Tok and the lofty Kowloon Peak are within the sight. Descend the trail, it passes some rest areas. 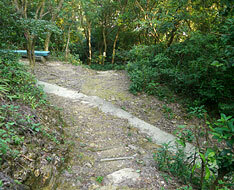 Further down, it comes to the cross junction of the horizontal concrete path. 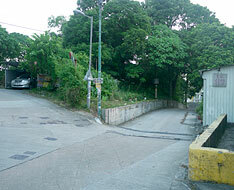 Heading forward could lead down to Po Lam Road North, and the left way to Yau Yue Wan. Afterward, follow the concrete path to the right, it winds and gently undulates along the hillside through the woods. Further ahead, it leads to the next cross junction. 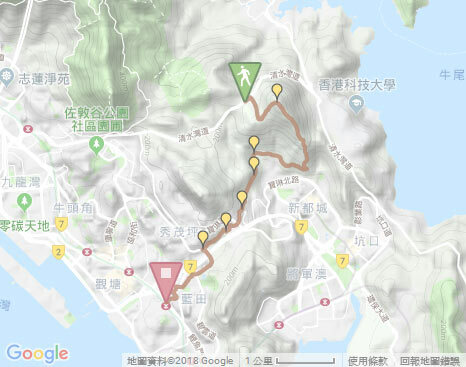 Taking the right path could follow Small Hawaii Path then join Wilson Trail to Tseng Lan Shue, and the left way to Po Lam Road North via Tseung Kwan O Village. Exit: At the cross junction after the downhill along the south ridge of Razor Hill, heading forward could lead to Po Lam Road North. Go ahead according to the signpost for the way to O Tau. 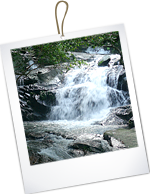 The gurgle of the stream could be heard gradually. Not far ahead, it comes to Small Hawaii Waterfall. It is spectacular for the rapid stream turbulently surging over cascades. The spray and the rised cool breeze make you fresh and cool. 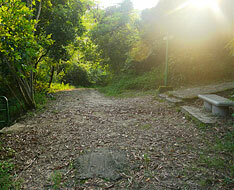 Afterward, continue to follow the well paved path (Lin Yuen Path), it returns to quiet at once. 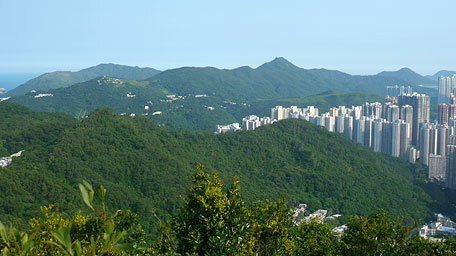 Along the way, Tsui Lam Estate could be seen on the left. Head to the junction, ascend the flight of steps on the right leading to Wilson Trail, and then follow the concrete road of Wilson Trail to the left until joining Tsui Lam Road. Along Tsui Lam Road to the right not far, it comes to the cross junction of Po Lam Road. Exit: You could take bus at Po Lam Road. 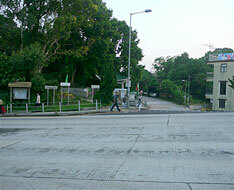 From the junction of Tsui Lam Road, cross the opposite side of Po Lam Road then follow Ma Yau Tong Road. After heading a very short distance, take the right pathway (NOT Wilson Trail). 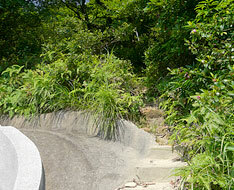 Along the pathway until the end at Fat Yuen Temple, follow the downhill concrete path on the right. 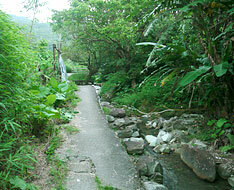 Head the path, it initially goes alongside the brook then gently descends through the woods until Sau Mau Ping Road. Afterward, follow Lin Tak Road on the left. 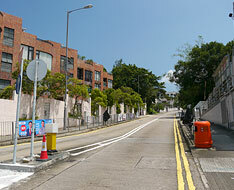 Passing through Hing Tin Estate, turn left to trace Hing Tin Street. 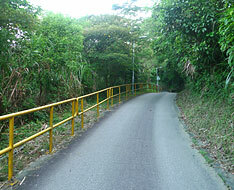 Not far ahead, follow the right road at the junction to enter Nam Tin Estate. By crossing the bridge and using the elevators, it descends to Tak Tin Street. Finally, through Kai Tin Estate on the left, it leads to Nam Tin Railway Station via Kai Tin Shopping Center. 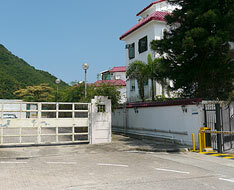 Exit: If not to pass through the residential buildings, you could take bus at the bus terminal of Nam Tin Estate. 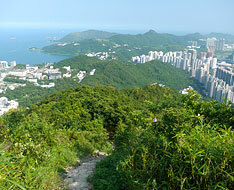 At the top of Razor Hill, it gives sublime scenery over Ma On Shan, Inner Port Shelter, the peninsula of Clear Water Bay and even Tseung Kwan O. However, overlooking from the hill, the buildings are more intensive and number of them still increases. 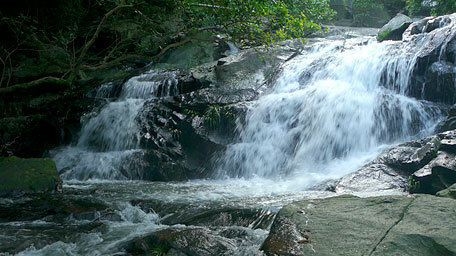 After the years, Small Hawaii Waterfall nearby seems to become the natural heritage. At that time, how much green woodland will remain?